Historical Background of the Book. Around 598 B.C., the Babylonians installed Zedekiah as king over Judah. While Daniel was in Babylon as a government official and Ezekiel was a captive, Jeremiah continued to prophesy in Judah. 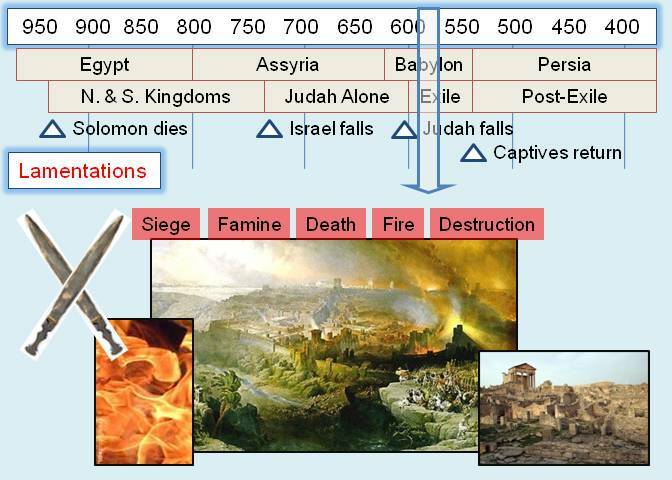 After about 10 years, Zedekiah rebelled which resulted in the third invasion of Judah by Babylon and an 18 month siege of Jerusalem, causing a severe famine within the city. The city's protective wall was finally breached in 586 B.C. (2 Kings 25; Jeremiah 39, 52). The Babylonian army slaughtered many of the inhabitants and took most who remained back to Babylon. The army burned all the major buildings. This included the temple that Solomon had built about 400 years previously. The temple's gold, silver, and bronze valuables were carried as plunder back to Babylon (see Dan. 5 for the vessels being used at Belshazzar's drunken feast). In short, the city was turned into a smoldering ruin. The Author and the Audience. The author of Lamentations is not specified, although it is traditionally attributed to Jeremiah. The audience is also not specified, although part of the book is addressed to God. The literary style of the book is somewhat unique. Chapters 1 through 4 are written as acrostic poetry (like Psalms 119) where each line uses a word that begins with a sequential letter from the 22 letter Hebrew alphabet. Outline/Major Themes. The book of Lamentations consists primarily of laments, expressions of deep grief over the fate of Jerusalem and her people. If Jeremiah is the author, such is not surprising given his 40 year dedication of warning the people to repent. Prov. 14:34 "Righteousness exalts a nation, but sin is a disgrace to any nation." The coming judgment of a righteous God - Psalms 19:7-9; Rom. 2:1-10; Rev. 16:4-7; 19:2. God's compassion & mercy - Lam. 3:22-25; Eph. 2:1-10 (esp. verses 4-5); 1 Peter 1:3-4; 2:9-10.